To many, the French Riviera connotes beaches and seaside chic. But some of the least explored places here are stone hilltop villages, just inland above the tourist-clogged beach towns on the coast. 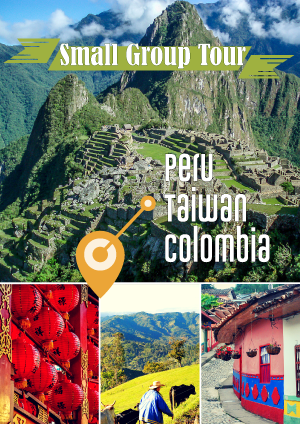 These quaint villages are perfect for both families and lone backpackers, who are looking for short day trips or overnight stays. Though you don’t want to altogether skip the French Riviera’s best coastal towns, such as Menton, Beaulieu-sur-Mer, Antibes, and Cannes, heading to the region’s charming and quiet hilltop villages, where time seems to slow, will offer worthwhile surprises, views galore, and a respite from the coastal crowds. Castellar, home to fewer than a thousand people, sits just above the seaside resort of Menton. 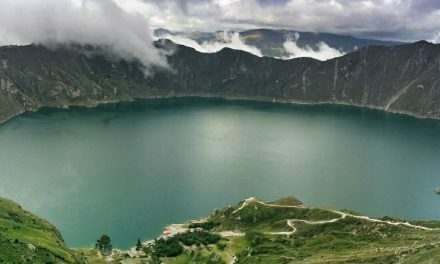 Even at the peak of summer tourist season, visitors are few and far between. The lack of any hotels means that you should plan to stay in one of the coastal towns. Or you could camp. Indeed, hike just two hours on a clear trail from Castellar to Col du Berceau (Craddle’s Pass), over 3,500 feet up, and reward yourself with breathtaking views. Spending the night requires as little preparation as packing some food and a blanket. If you do sleep under the stars, make sure to get up early for the spectacular sunrise over the sea. Castellar is thus a perfect stepping stone to the mountains. On your way down from the Berceau, stop at either the village’s cafe (open year-round) or restaurant (open seasonally). Then meander through the silent Medieval streets, see the church, and just take it easy. You’ll escape the oppressive heat and crowds by the seaside, take in some nature, and get a little exercising in. The effortlessness of getting to Castellar makes it all worth it: it’s just a 20-minute bus ride from busy Menton (€1,50). Check the schedule, which varies seasonally, with fewer rounds on Sundays. Castellar’s ease of access from the coast (with all its amenities, hotels, and beaches) paired with its sense of remoteness and “real” France, and proximity to nature, make it an ideal day trip. The municipality of Roquebrune-Cap-Martin comprises two very distinct parts. On one hand, Cap Martin is right on the sea, bustling with tourists, and clogged with traffic. 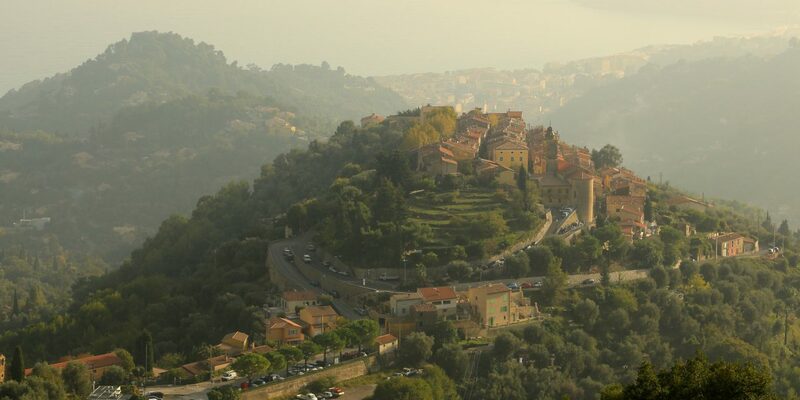 But on the other, few people make it to the Medieval village of Roquebrune, hidden from view up a hillside. Within walking distance from the beach, and even from Monaco and Menton, the village of Roquebrune is home to a wonderfully restored castle (€3-5). 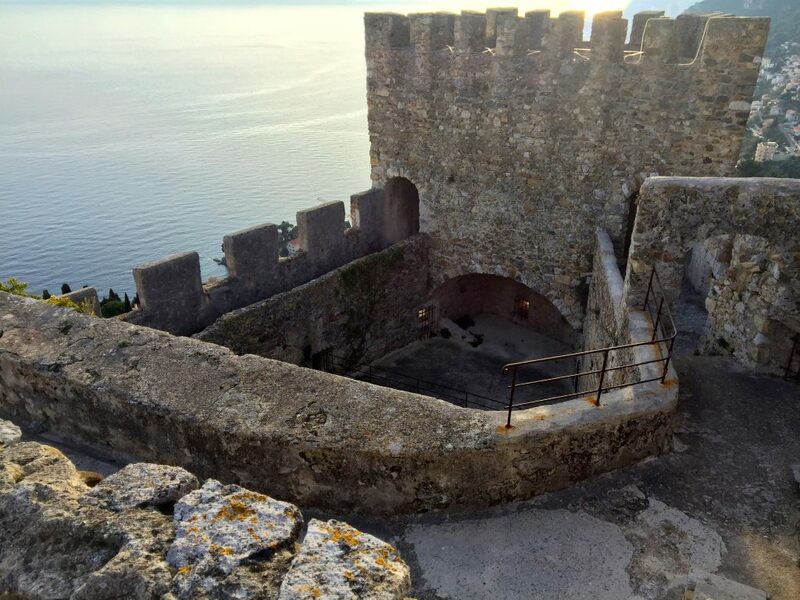 Explore its passageways and take in the view of the village and the Mediterranean beyond from its towers. Be sure to get the audio guide (included in admission) to learn about castle life back in the day. If you go in summer, call ahead or head to the Roquebrune tourism office to inquire about concerts and plays put on regularly in the castle’s courtyard, overlooking Monaco. After the castle, wander around the all-pedestrian cobblestone streets. Peak into beautiful Saint Margaret church, and have a coffee on Place des Deux Frères. On your way down to the Cap Martin part of town, don’t miss the Olivier Millénaire, the oldest olive tree on Earth, at around 1,800 to 2,200 years old. Unlike Castellar, Roquebrune has a small hotel or two, and a few quiet quality restaurants (open seasonally), plus an art gallery. Roquebrune is slightly off the beaten track, but within arm’s reach of the seaside. 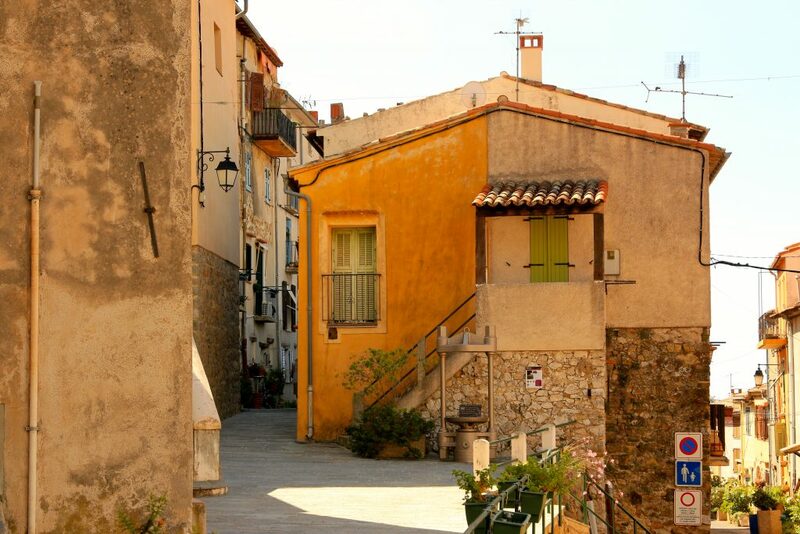 So if a quiet yet accessible village is your thing, Roquebrune is the place for you. It makes the best hilltop villages of the Riviera through a combination of village charm and beach access. Perched high above the Mediterranean coast, this Medieval village, once a bustling bastion, is a jewel in the Riviera’s crown. Eze stands apart from Castellar and Roquebrune in that it attracts many more people, for good reason. 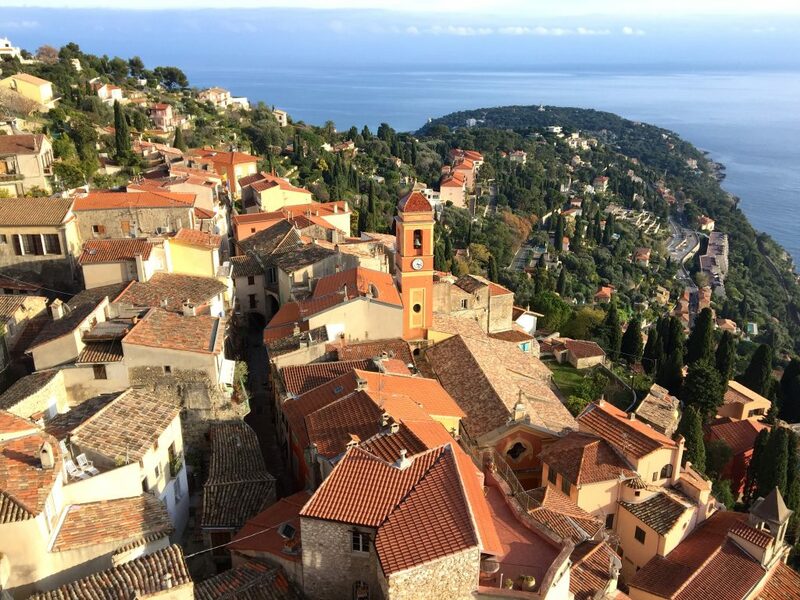 From Eze-sur-Mer train station, you trek 45 minutes up to the hilltop village along the Nietzsche Trail, named after the man who vigorously climbed it many times. Nietzsche wasn’t the only celebrity to come here. Have a homemade delicacy on the terrace of the Chèvre d’Or, a world-famous luxury hotel, or splurge with a room, and chances are you’ll see the likes of Roger Federer or George Clooney. The classic Eze itinerary is quite straightforward. After the Chèvre, zig-zag up through the narrow stone alleys of the village, glimpsing the sea here and there. 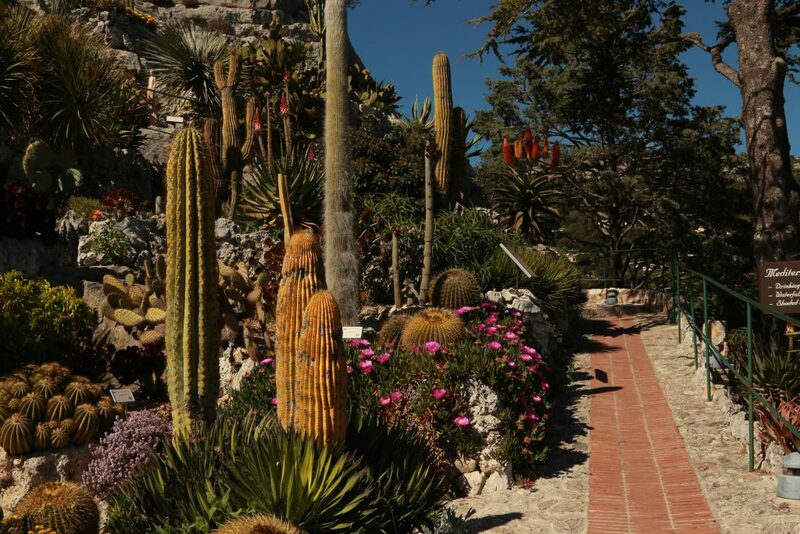 At the top, what was once the Eze castle has been converted into a spectacular exotic garden (€3,50-6). Spend an hour or two making your way through the castle ruins. Learn about the hundreds of rare plants here. But above all, the views are unbeatable. Take your time on your way down from the gardens. 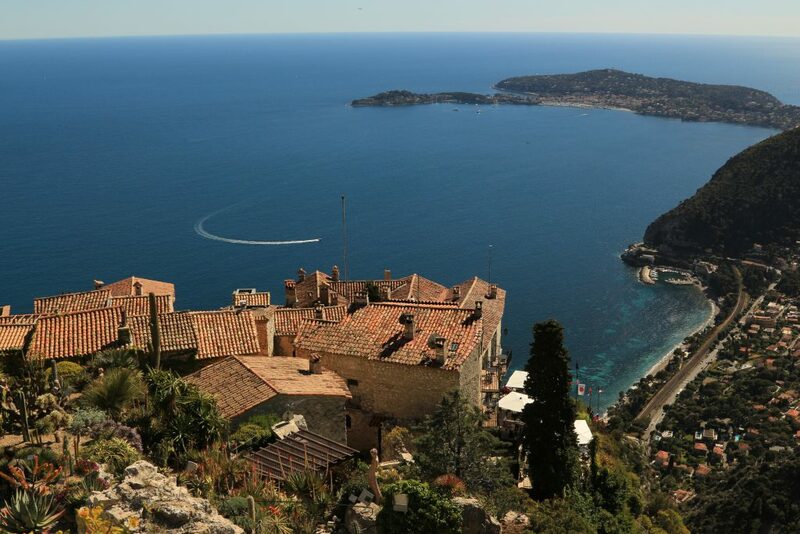 Eze is known for its many crafts shops, jewelry stores, and private art galleries. 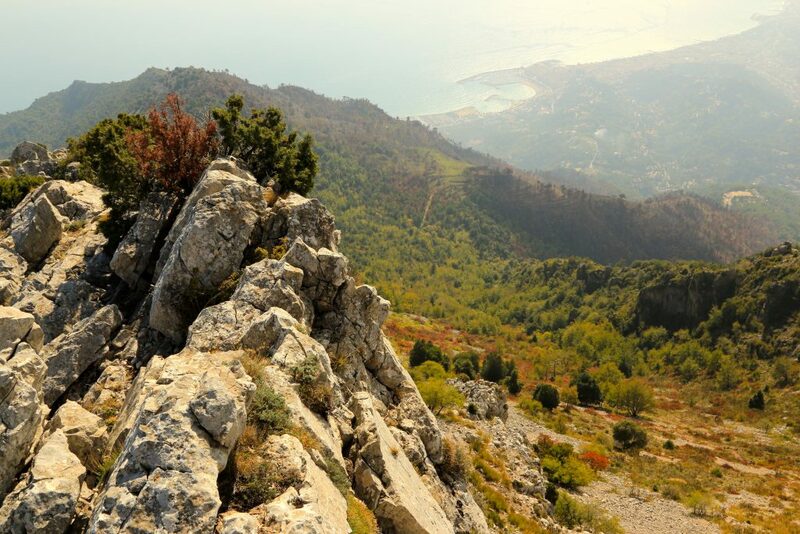 If you have a car, Eze is a great starting point for the Grande Corniche, a remarkable road running parallel to the coast at over 1,500 feet up. So go ahead and enjoy the Riviera’s stunning evening light and sunset from up here. For all three hilltop villages portrayed here, Nice airport (NCE) provides the easiest access. There are daily flights from New York JFK, Dubai, and Doha, and plentiful connection options through most European cities. You can also easily get to the Riviera by train from places like Paris, Marseilles, or Milan, Italy. Once in Nice, take the regional train (TER), which is the cheapest and fastest way to move up and down the Riviera, great views included. There is a station near the airport (Nice Saint-Augustin), in downtown Nice (Nice Ville), and in Menton, Roquebrune-Cap-Martin, and Eze-sur-Mer. From there, local bus or walking, depending on if you’re staying for more than a day, are the best ways to make it up to the villages (all east from Nice). You won’t pay more than €10 to get wherever you want to from Nice, and there are discounts for children as well as day passes. Menton will be the farthest from Nice, about 40 minutes by train. Renting a car can be expensive, and summer crowds and narrow roads make the train the better option. In any case, to avoid the tourist frenzy, go in May or September if you can. Hotel and flight prices also skyrocket during the summer. Thinking of heading to Portugal instead? Check out our Best Beach Towns of Southern Portugal.